This is a simple, classic fettuccine Alfredo recipe made with butter and Parmesan cheese. This can be made with half-and-half or light cream, but use heavy cream or whipping cream for the richest sauce. The pasta and sauce take just minutes to prepare and cook, and it is a rich and delicious pasta dish. Fettuccine Alfredo is great with ham or chicken, or add some steamed peas or broccoli florets. It's excellent with garlic as well. See the tips and variations below for more ideas. Cook the fettuccine noodles in boiling salted water following package directions. Drain the fettuccine well and add to the cream in the sauté pan. With the pan over medium heat, toss well and add butter pieces, nutmeg, salt, pepper, and 1 cup of Parmesan cheese. Toss again while heating through. Serve the pasta with steamed vegetables or salad and more grated or shredded Parmesan cheese. 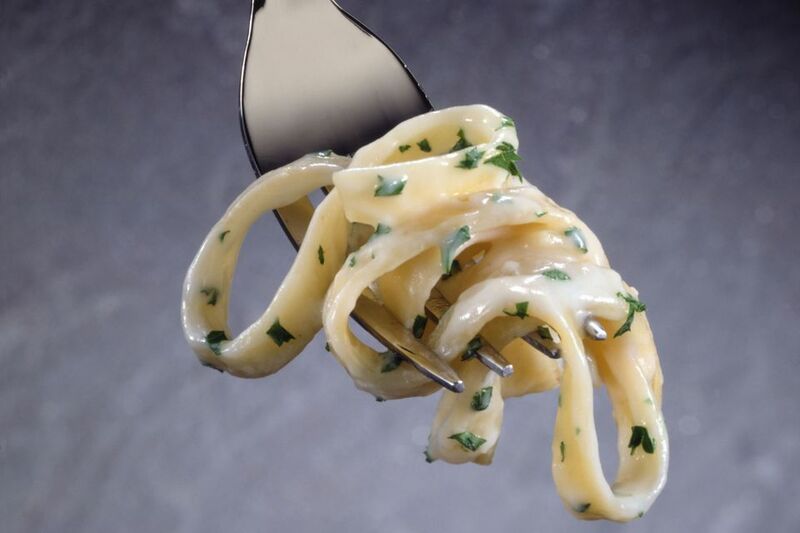 Garnish the fettuccine Alfredo with chopped flat leaf parsley. Toss the pasta and sauce with about 1 cup of steamed fresh or frozen peas. Add 1 to 2 cups of steamed broccoli florets to the pasta and sauce mixture. Add 1/2 to 1 cup of diced cooked ham along with steamed fresh or frozen peas. Toss the pasta and sauce with about 1/4 cup of sliced green onion tops. With Garlic: Saute 2 to 3 cloves of garlic, minced, in half of the butter for about 2 minutes. Add to the cream along with the remaining butter pieces and continue with the recipe. With Chicken: Slice 4 chicken tenderloins into small pieces. Brown the chicken in a skillet in a small amount of vegetable oil or butter. Sprinkle with seasoned salt or Cajun or Creole seasoning. Toss the cooked chicken with the fettuccine and sauce.